If the answer is yes, and if you’d like to find out how you, too, can seek a similar opportunity, then stick with me. This post is for you if you know for sure that you’re an expert and you’d like journalists to quote you. It’s also for you who has been trying to get journalists to notice you to no avail. In this post, I’m going to share some ideas you should consider before you write your press release. But before I go on… why should you listen to me? I’ve worked as a journalist and also as the editor who chooses stories for magazines and blogs. I’m also a press release copywriter. This means I’ve been in both camps: the camp that either loves or bins your press release and the camp that knows what journalists and editors want and therefore helps you write press releases that get better results. First, learn how to pick a story that would position you as the expert. Then choose what to say, and in the right way, to show that you’re important. And learn how to write a press release. You then select the right outlets to pitch or distribute your news to at the right time. And then respond the right way when journalists contact you for further information. Today, though, we’re discussing how to pick the best story that would position you as the expert. If you can get this bit right, you have a better chance of getting your story picked and featured. So how do you do it, especially when you don’t have any news? Let me share some insider tips with you. The best topic when you don’t hard news is a topic that allows you to comment on a trending topic and as an expert in the field. This gives you the opportunity to show journalists that something’s going on and their audience needs to know about it. It also demonstrates that you’re being useful. This way, you become an instant educator and advocate for the audience you’re targeting and who are being affected by this ‘event’. So, first look for something that is big enough and worth talking about. This topic must tie in with the services or products you sell. Let’s say you’re the owner of a security camera company and you want to sell more systems that allow property owners to log into their live video surveillance feed remotely to check on their children or pets. That’s your main theme: live video surveillance. Now that you know your theme. What’s the message? Narrow it down so you’re targeting a specific audience. Say you’re aware that many parents would love to use live video surveillance to keep an eye on their teenagers who are home alone. You want to remind them that it won’t break the bank to upgrade to a better system if they want peace of mind. However, that’s not a strong enough message. Let’s think some more. You want people to really take notice. To do this, pique interest by stirring one or two emotions. Mention something that scares, excites, angers or educates them. Otherwise, journalists just think “Meh!” and skip to the next email. I do this by combining the topic with a story. I jump onto Google or social media to search for ideas. You could look for recent mentions of teenagers who got harmed because their parents left them home alone. Or they threw parties and wrecked their homes while their parents were on a weekend away. Perhaps even stories where the parents got in trouble with the law. Go on… piggyback on that trending topic. As you can see, what you’re really doing is mixing your services (your expertise) with a story that would pique interest. In this example, parents would be familiar with the story you’re linking to your services. But make sure it’s a story that makes them agree with you. To agree that they should get a system that helps them watch their children. #1: You’re a mechanic and a road safety advocate. You’ve always reminded customers about child car restraint laws but many are still driving around with damaged restraints. You want to remind the public about the risks they’re taking. #2: You’re an air con specialist and you’re aware of a least a dozen senior citizens who got conned by fake salesmen. You want to warn other seniors about these conmen. #3: You’re a new fashion designer and a local celebrity has picked you to dress them for the red carpet. You want the world to know. Now, brainstorm some ideas for your business. Look for a topic that suits the audience for the newspaper or station you’re targeting. Step 3: Review your idea. Is it a good story? Keep in mind that what’s interesting to you may not necessarily be interesting to a journalist. Say you’re running a medical clinic. You’ve recently relocated because you need more space for a new kind of equipment that will, for the first time ever, help doctors detect a specific medical condition. You’d like to let everyone know that you’ve moved. Would the journalist care about your move to a new location? Very unlikely. However, they would care if you make the story about the new equipment which “detects a specific medical condition”. Tell them what makes this equipment so special and how their audience would benefit from it. Make the journalist care even more by inviting them to see how this machine works. Let them take photos or film a video of it in action. Even better, make a patient available to chat with the journalist about how this equipment has helped them. Isn’t that better? It’s relevant, timely and more interesting. Write a story, not an advert. When writing press releases that position you as an expert, you’ll get better results if you make journalists see your story first and your business second. Yup, even when you’re trying to boost sales, it shouldn’t be about you. Now that you have a story, your next job is to package your amazing idea and to sell it to the media. This is where you need to be careful so journalists don’t open your press release and think, Urgh! Another advert! Next! The best way to sell your expertise as news is to sell WITHOUT selling. Otherwise, journalists will see right through your faux news! So, don’t talk about your business unless absolutely necessary. Instead, talk about the problem and solution like in this article. As you can tell, your press release isn’t really about you. You just happen to be the expert on the topic. Your press release must be about the people you’re helping, the people who need to take action. The people who need your services or products. The people who will remember you when they need whatever it is you’re offering. 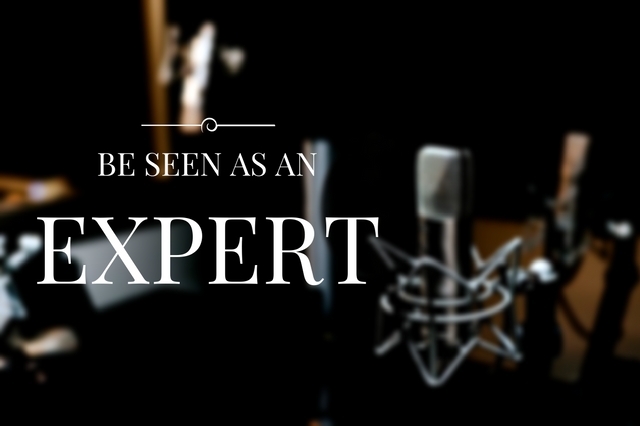 If you want to appear as THE expert, make it about THEM. If you need a hand choosing a topic or writing your press release, feel free to reach out to me. I’ve helped my clients appear in the news without much fuss.